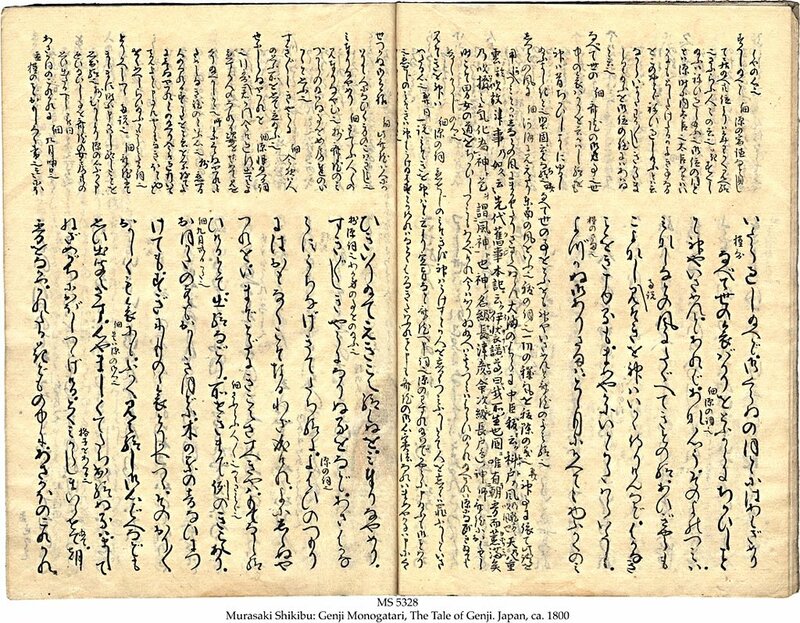 Description	 MS in Japanese on paper, Japan, ca. 1800, 20 ff. (complete), 26x18 cm, 12 columns, (24x15 cm) with 18-20 characters in Shodo (calligraphic cursive script) per column, commentary in 24 columns at top of page in Shodo and Kanji (Chinese characters) with 10-15 characters per column. Binding	 Japan, ca. 1800, light brown paper covers, stitched on 4 stations (Xian Zhuang). Context	 Vol. 20 from a set of 54 vols., corresponding to the 54 chapters of the Genji. Provenance	 1. Kimio Koketsu, Ohya-Shobo Ltd, Tokyo. 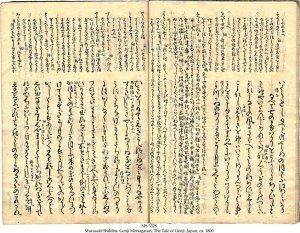 Commentary	 The Tale of Genji is considered to be the supreme masterpiece of Japanese prose, one of the world’s greatest novels, and the greatest work ever of a female author. Murasaki Shikibu finished her work, also considered to be the world’s first novel after the ancient period, in 1021. Her real name remains unknown. She is named after the beloved wife of Genji, Murasaki. The work recounts the life of Genji, the second son of the Japanese Emperor and comprises some 400 dramatis personae.